The pigeon guillemot is a small to medium-sized black and white seabird. It can be distinguished by its bright orange feet that may be visible while paddling in the water and in flight, and in summer by its white wing patches that stand out against an all-black body. A small black bar swooping into the white patch from below may not be visible. 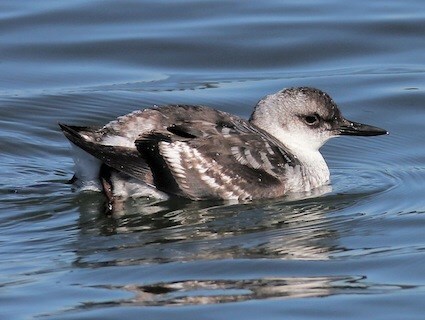 Winter adult and juvenile plumage is similar except both have white bellies and throats, and white mottling on their black body. Click here for some beautiful photos of this species. The pigeon guillemot spends its winters on the oceans off of the West Coast of North America, and can be found year-round in nearshore coastal regions from Alaska south to Mexico. It is most common along rocky shorelines, and nests on mainland cliffs and islands. 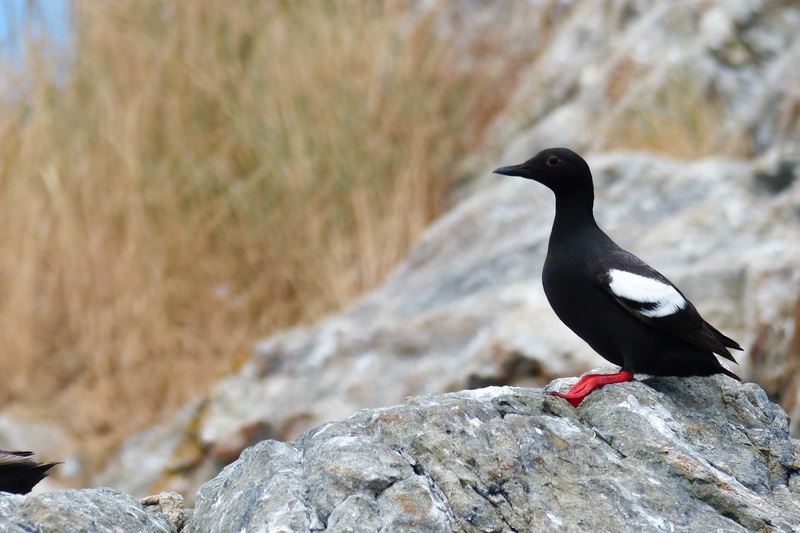 The black guillemot (Cepphus grylle) is very similar to the pigeon guillemot, but the white patch on its wing is not broken up by a black bar and it is also slightly smaller. The ranges of the two species only overlap in the Bering Sea. Pigeon Guillemot Cepphus columba. Audubon Birds. National Audubon Society. Accessed 25/03/2015. Pigeon Guillemot Cepphus columba. The Birds of North America Online (A. Poole, Ed.). Ithaca: Cornell Lab of Ornithology; Retrieved from the Birds of North America Online. Accessed 03/03/2013.